SpaceX postpones Falcon 9 launch to conduct nose cone checks. SpaceX has delayed its weekend launch of the Spanish communications satellite Hispasat 30W-6 to allow time for extra tests on the Falcon 9 rocket. 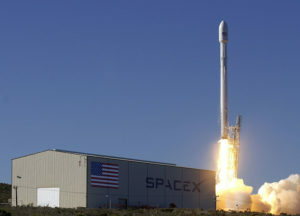 The Falcon 9 was scheduled to launch the satellite Sunday (Feb. 25) at 12:35 a.m. EST (0535 GMT) from Space Launch Complex 40 at the Cape Canaveral Air Force Station in Florida. But on Saturday, SpaceX said it needed extra time to test the rocket’s payload fairing, the nose cone that protects satellites during flight. A new launch date has not been officially announced yet. A SpaceX spokesman said they will try to land the rocket on their “Of Course I Still Love You” drone ship in the Atlantic Ocean. The Hispasat 30W-6 satellite owned by the 25-year-old Spanish communications operator will provide coverage across Europe, North Africa, Brazil and the Andes mountain range in South America. The Spanish operator distributes more than 1,250 television and radio channels through its satellites. The 30W-6 satellite will orbit the Earth in a geosynchronous orbit in the 30-degrees west position, and it will replace the older Hispasat satellite. The new Hispasat 30W-6 is designed to last at least 15 years in orbit.